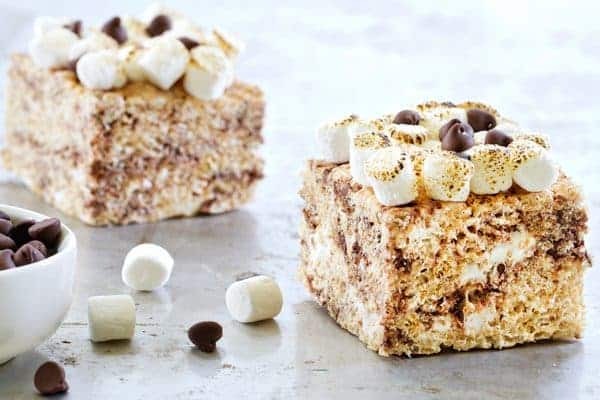 S’mores Marshmallow Crispy Treats are a fun twist on a classic dessert. 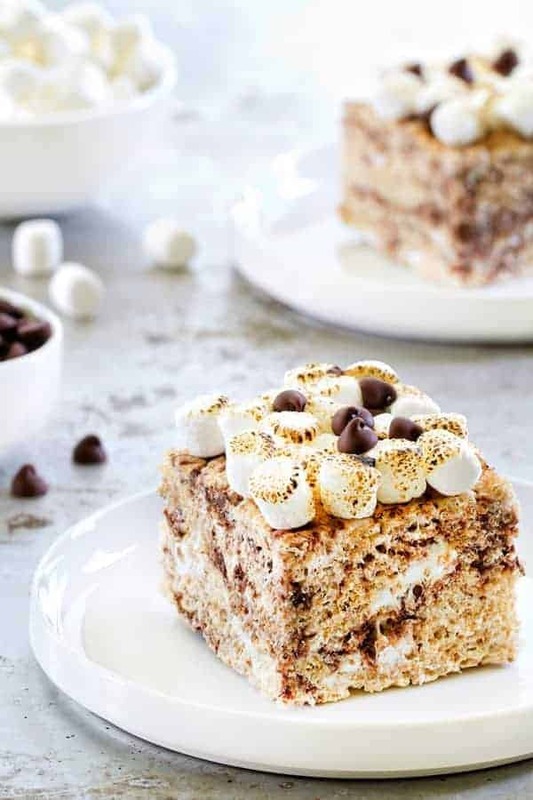 Loads of marshmallows, graham cracker crumbs, and chocolate makes them a simple and delicious dessert for any occasion. If you happened to read my No Bake Frozen Cheesecake post, you know that it’s been scorching hot here in Ohio. And since being hot is one of my least favorite things in the world, I’ve been going the no bake route – a lot. While we were on vacation, Elle developed quite the love of marshmallow crispy treats. If I’m being honest, they weren’t homemade, we actually picked them up at a market bakery and they were amazing. They were super thick just like my Birthday Marshmallow Treats and they had little flecks of chocolate mixed in which made them even more delicious. Since we’ve been grilling outside a lot, we’ve also been having traditional s’mores on the regular. There’s just something so incredible about perfectly toasted (or burnt) marshmallows sandwiched between two graham crackers and melty chocolate. So simple, but so darn good. We seriously can’t get enough. Last week, I decided to combine two of favorite simple treats into one delicious dessert. And since I like things to be a bit over the top, I added a layer of sweet, toasty marshmallows to the top of each treat just before serving. 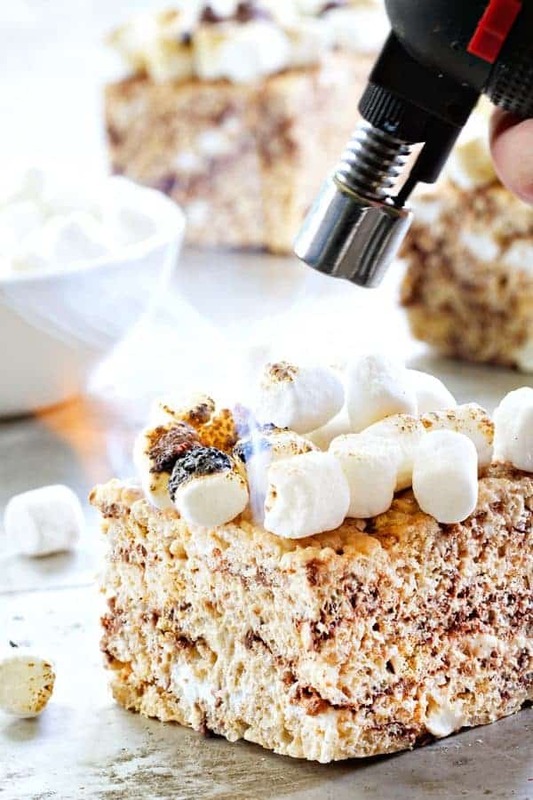 Totally not necessary, but in my opinion, if you’re not covered in melty marshmallow goodness while eating any type of s’more, you’re doing something wrong. 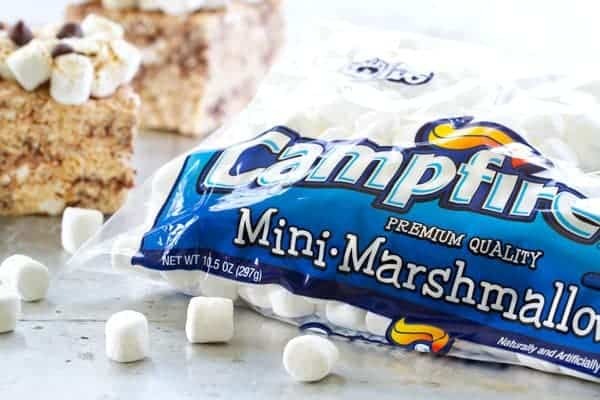 It’s no secret that I am obsessed with Campfire® Marshmallows. We add their Fruit Swirlers to just about every fluff salad, the Giant Roasters are my favorite for those grilled s’mores, and the sweet Mallow Bursts (Key Lime is my absolute favorite) are my go-to “need something sweet RIGHT NOW” treat. If you’re a marshmallow lover, you’ll definitely want to stay tuned for loads of ooey-gooey goodness! You seriously have to check Emily’s Marshmallow Dipped Ice Cream Cones, they are so perfect for summer entertaining. 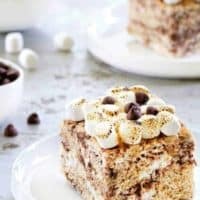 Jamie, these S’mores Marshmallow Crispy Treats look amazing! I’m also in Ohio, but I’ve actually been loving the hot weather. :) Can’t disagree about trying to do no-bake whenever possible, though! Love this idea, and great dessert for the Fourth of July holiday weekend! Thank you, Stephanie! Happy 4th! This has got to be the most perfect crispy treat I’ve ever seen!! S’mores! You can never go wrong with them. I could not agree more with the no-bake approach for summer treats! Wow, this is such a fun twist on 2 classic treats! These sound amazing!